The perfect way to keep in touch, these striking personalised Doc McStuffins walkie-talkies are ideal for use indoors and outdoors, press the talk button and speak while the other user listens to the conversation. On/off LED indicator, flexible antenna. Requires 2x9V batteries not included…. This toy costs approximately £9.99 (for the latest and best prices make sure you check our retailer list for the Doc McStuffins Walkie Talkies above). 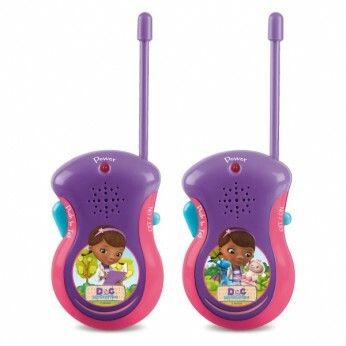 In our review of Doc McStuffins Walkie Talkies we classed it as being suitable for ages 3 years, 4 years, 5 years but recommend you check the manufacturer specific advice before purchasing.